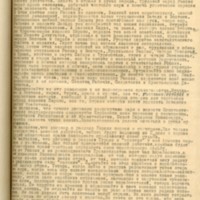 Translation source: http://soviethistory.msu.edu/ | USSR, Sixty Years of the Union, 1922-1982 (Moscow: Progress Publishers, 1982), p. 35. “Обращение Ко всем трудящимся мусульманам России и Востока,” Russian Perspectives on Islam, accessed April 18, 2019, http://islamperspectives.org/rpi/items/show/11587. Великие события происходят в России. Близится конец кровавой войне, начатой из-за дележа чужих стран. Падает господство хищников, поработивших народы мира. Под ударами русской революции трещит старое здание кабалы и рабства. Мир произвола и угнетения доживает последние дни. Рождается новый мир, мир трудящихся и освобождающихся. Во главе этой революции стоит рабочее и крестьянское правительство России, Совет Народных Комиссаров. В этом святом деле Россия не одинока. Великий клич освобождения, данный русской революцией, подхватывается всеми трудящимися Запада и Востока. Истомленные войной народы Европы уже протягивают нам руку, творя мир, Рабочие и солдаты Запада уже собираются под знамя социализма, штурмуя твердыни империализма. А далекая Индия, та самая, которую веками угнетали "просвещенные" хищники Европы, подняла уже знамя восстания, организуя свои Советы Депутатов, сбрасывая с плеч ненавистное рабство, призывая народы Востока к борьбе и освобождению. Перед лицом этих великих событий мы обращаемся к вам, трудящиеся и обездоленные мусульмане России и Востока. Мусульмане России, татары Поволжья и Крыма, киргизы и сарты Сибири и Туркестана, турки и татары Закавказья, чеченцы и горцы Кавказа, все те, мечети и молельни которых разрушались, верования и обычаи которых попирались царями и угнетателями России! Отныне ваши веровании и обычаи, ваши национальные и культурные учреждения объявляются свободными и неприкосновенными. Устраивайте свою национальную жизнь свободно и беспрепятственно. Вы имеете право на это. Знайте, что ваши права, как и права всех пародов России, охраняются всей мощью революции и ее органов, Советов Рабочих, Солдатских и Крестьянских Депутатов. Поддерживайте же эту революцию и ее полномочное правительство! Мусульмане Востока, персы и турки, арабы и индусы, все те, головами и имуществом которых, свободой и родиной которых сотни лет торговали алчные хищники Европы, все те, страны которых хотят поделить начавшие войну грабители! Great events are taking place in Russia. The end of the bloody war, which was begun with the purpose of partitioning other lands, is drawing near. The rule of the robbers and enslavers of the peoples of the earth is about to end. Under the blows of the Russian Revolution, the old world of serfdom and slavery is crumbling… A new world is being born, a world of workers and free men. At the head of this revolution stands the Workers’ and Peasants’ Government of Russia, the Soviet of People’s Commissars. All Russia is sown with revolutionary Soviets of Workers’, Soldiers’, and Peasants’ Deputies. The power in the country is in the hands of the people. The laboring people of Russia have but one burning desire-to achieve an honorable peace and to aid the oppressed peoples of the earth to fight for their freedom. In the face of these great events we turn to you, toiling and disinherited Muslims of Russia and the East. 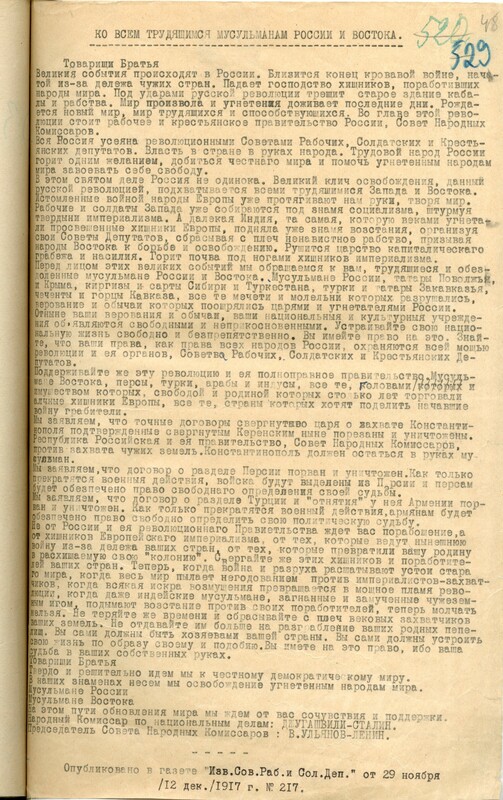 Muslims of Russia, Tatars of the Volga and the Crimea, Kirghiz, and Sarts of Siberia and Turkestan, Turks and Tartars of Transcaucasia, Chechens and Mountaineers of the Caucasus–all those whose mosques and chapels have been destroyed, whose beliefs and customs have been trampled under foot by the tsars and oppressors of Russia! Henceforth your beliefs and customs, your national and cultural institutions, are free and inviolable. Build your national life freely and unhindered. You have a right to do so. Know that your rights, as well as the rights of all peoples of Russia, are protected by the Soviets of Workers’, Soldiers’, and Peasants’ Deputies. Defend this revolution and its plenipotentiary government! Muslims of the East, Persians, Turks, Arabs, and Hindus, all those for whose lives and property, liberty and land, the greedy robbers of Europe have bartered for centuries-all those whose countries the plunderers who started the war wish to divide! We declare that the secret treaties of the dethroned Tsar regarding the seizure of Constantinople, which were confirmed by the overthrown Kerenskii government, are null and void. The Russian Republic and her government, the Soviet of People’s Commissars, is opposed to the seizure of foreign territory; Constantinople must remain in the hands of the Muslims. We declare that the treaty regarding the partition of Persia is null and void. As soon as military operations are brought to an end, the troops will be withdrawn from Persia and Persians will be guaranteed the right to choose freely their own destiny. We declare that the treaty regarding the partition of Turkey and wresting from her of Armenia is null and void. As soon as military operations are brought to an end, the Armenians will be guaranteed the right to decide freely their political destiny. Throw off these ravishers and enslavers of your country. Now that war and desolation are tearing down the structure of the old world, when all the world is aflame with wrathful indignation against the imperialist plunderers, when every spark of revolt kindles into a mighty flame of revolution, when even the Indian Muslims, worn out and suffering under the foreign yoke, are starting a rebellion against their oppressors–now it is impossible to be silent. Do not waste any time in throwing from your shoulders the age-long enslavers of our land. Do not permit them longer to rob you of your native homes. You yourselves must be the masters of your country. You yourselves must build your life in your own way and according to your own desires. You have this right, for your fate is in your own hands. Firmly and decisively let us strive for an honorable, democratic peace. On our banners we proclaim the liberation of oppressed peoples of the world. We await your sympathy and support in this cause of building a new world.